Soon after, Thomas P. Caudell, a former Boeing researcher coined the term “Augmented Reality” (AR). This was not merely a new name for an existing concept, but a separate new direction of virtual reality, which grew to become a distinct branch in its own right. Unlike virtual reality, augmented reality does not replace the real world around you entirely, but augments and enriches it instead, adding layers of information on top of the things that surround us. 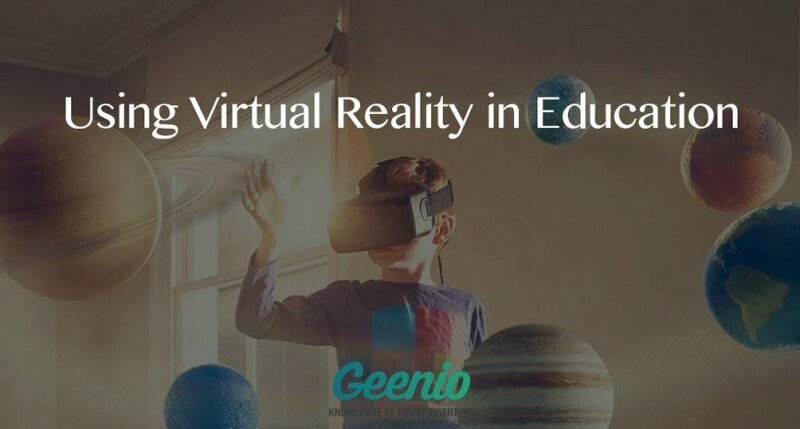 So, what is the practical usage of virtual reality in education? The proliferation of smartphones gave virtual and augmented reality a big push. These devices, portable and equipped with positional sensors, enabled practical applications for both virtual reality and augmented reality. Apps capable of overlaying images captured with the phone camera with metadata, or charting the shortest route towards the nearest bank branch or one’s favorite store outlet started becoming a reality. The advent of mobile phones has started a new turn in the virtual reality’s evolutionary spiral. In 2014, during the Google I/O conference a virtual reality device called the Google Cardboard was unveiled. Lightweight and cheap to produce, it is made of cardboard with optical lenses, magnets, and clamps to hold a smartphone in place. Thanks to the popularity of smartphones and the accessibility of Google Cardboard, virtual reality became widespread as a new and experimental medium for educational purposes. The emergence of Google Glass made a big splash, and got people talking about augmented reality and the possibilities it promised. Many critics were skeptical towards the Glass and dismissed it as a toy with no practical application. But there were those who recognized the potential it had for instructional purposes. Just imagine, how much easier it would be to train new employees/students if you could just give each of them a Glass headset and the necessary tools, and then start projecting the information relevant to the task, thus enabling them to work directly with real equipment in a simulated work environment. As an alternative, instead of fitting the classroom with expensive hardware, you could overlay the real classroom with virtual objects and have your students manipulating those. Oculus Rift, a virtual and augmented reality headset scheduled for release on March 28th, 2016 will, no doubt, find many applications in the education field. Needless to say, the practical applicability of virtual reality and augmented reality in eLearning is a hotly discussed topic right now. A recent report produced by Horizon 2016, one of the most respected analytical groups, dedicates a number of pages to the question of using augmented and virtual reality in education. For now, potential applications in the fields of physics and medicine show the most promise. This being said, what good can these newfangled technologies do? First of all, virtual reality can transport students to the farthest corners of our planet the observable universe in the blink of an eye and immerse them in a deep and engaging educational environment. Great motivational potential is another major benefit. Which is cooler? To read pages upon pages of text accompanied by black and white illustrations, or to find yourself on Mars and gather soil samples by hand? By the way, that was a rhetorical question. The virtual reality is still very much in its infancy, and is not widely available to the general public. However, certain practical applications of the technology are already on the market. For example, one can create virtual panoramic tours with images overlaid with text, which enable learners to explore the object of study from all sides. 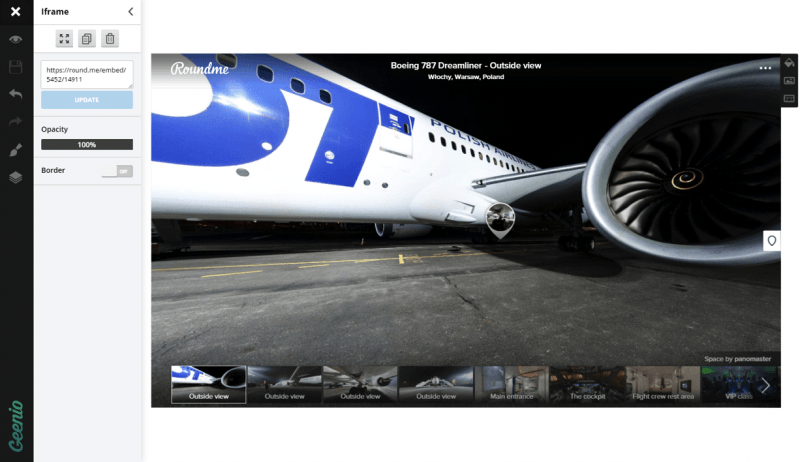 As an example, here’s a virtual tour of the Boeing 787 jet liner created via the Roundme platform. 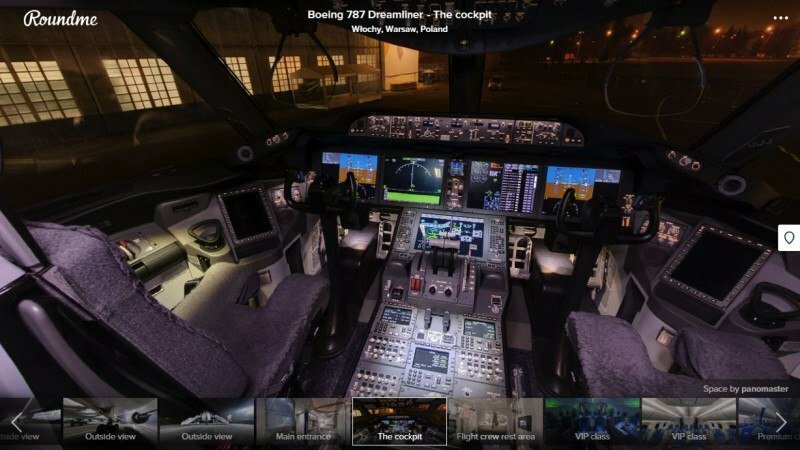 This is not merely a collection of photographs, but a virtual environment that allows the user to move about and examine the plane both inside and out. It would appear that the University of Melbourne, too, has come to the conclusion that virtual reality can be used for educational purposes. The teaching staff created The Tidal River coast of Wilsons Promontory virtual environment, where every part of the tour is accompanied by detailed visual and textual commentary. Thus, while roaming the virtual world, students can linger in places that catch their attention and learn more about what they see and how it is related to the subject matter being studied (for example, the chemical processes local rock is subjected to and their consequences). Roundme enables the user to create virtual environments overlaid with useful information, and their imagination is the only limit. Panoramic tours can be used for subject matter other than geographical locations - one can, for example, create a virtual operating theater to be used for teaching future surgeons the necessary procedures and helping them familiarize themselves with the equipment. And seeing as Roundme supports Google Cardboard, the education process need never again be a dull and shallow affair. Imagine a company that has just purchased a batch of new equipment that nobody in the organization has worked with before, and that is generally unlike anything that had been used so far. The equipment is currently being delivered from across the world, and is scheduled to arrive in a few months. The task is to train the employees of several departments, so that they are able to operate the new hardware as soon as it comes in. To achieve this goal, the company arranges for a photograph to take panoramic shots of the equipment at the supplier’s warehouse with the aim of turning them into a virtual course. While the equipment is underway, the photographer uploads the photos they took to Roundme and creates a new virtual environment featuring transitions - or “portals” - from one part of the device to another. Then, an eLearning professional is engaged to overlay the virtual environments with so-called “hot spots”, complete with textual explanations and illustrations to be produced by clicking the mouse or focusing the virtual reality headset on one of them. Then, the thus prepared virtual environment is transplanted to a course created in Geenio, where it is prepended with introductory text and videos, and accompanied with other relevant study materials. And after a learner has emerged from the virtual tour, a test can be used to check the comprehension of the material and help the student in retaining what they have learned. In the end, we have a full-fledged teaching course, able to leverage the virtual reality technology to engage and motivate students. We are at the threshold of a new technical revolution, and I am certain that in the coming years both virtual and augmented reality will be used in new groundbreaking ways, undreamed of by even the most forward-thinking futurologists. This is frontier territory, with no trendsetters and no rules set in stone, so be bold, experiment, and who knows - maybe you will become the founder of the new standard of virtual education that will be voted best ever in year 2024!